It's summer holidays, finally. I was anticipating this moment probably as much as my son. No more school uniforms to iron the night before. No more alarm-clock induced awakenings at 6.30am. No more lunchboxes to pack at 6.35am. No more homework to oversee. No more pick-ups in the afternoon that would very often have me run around like a headless chicken before as I needed to squeeze in other tasks into the day. None of this until September. I love to have my children at home. And my kids love to be at home too. They hardly ever get bored. Most often I only play a supporting role in the day's activities, at times I am only needed to serve food. They keep busy, either one another or each one with their own little projects. Relaxed days are lying ahead of us, with the occasional outing to the movies. We live in a neighborhood that's just perfect for kids. The back door of the garden behind our house opens to a little park, and so do two dozen of other people's back doors. Most of these people are families with kids. The park itself doesn't have much to offer. There are two swings, a little sandpit and a basketball court. That's all. In the afternoon, the children would just come out their backdoors and play with whoever is there. It's a very organic way of getting together and playing. Spontaneous and real. Younger kids are being included or just tag along. Games are being invented on the spot. Even if the swings were broken and the basketball court fallen apart, they would never be a shortage of games to play. A ball, a bucket to collect treasures, a skipping rope, or bikes, scooters and tricycles is all they need. My kids are not interested in structured afternoon classes. They rather kick a ball or ride a bike as they like. We have hardly ever had play dates. Those few that we had weren't really big disasters, but my kids have realized that they are much better off when they can do what they want instead of having to play with the one guy/girl the whole afternoon that came over. I totally agree and support this. My kids are 4 and 6 years old. I think they should spend as much time as possible doing their own thing, as opposed to being told what to do. My son spends 7 hours in school everyday, which I find extremely long for a six-year old. Unfortunately, this is how it's done in International and British curriculum schools these days. When I was that age (and in Germany), I was never in school for longer than 4 hours. Yet, I still made it to university and got my degree. For some reason, I doubt that my son will learn more in school than I did in less hours. Oh well, over the next two months I don't have to get upset about this. It's holidays. With light and quick lunches, refreshing salads, and lots of fresh fruit and vegetables. 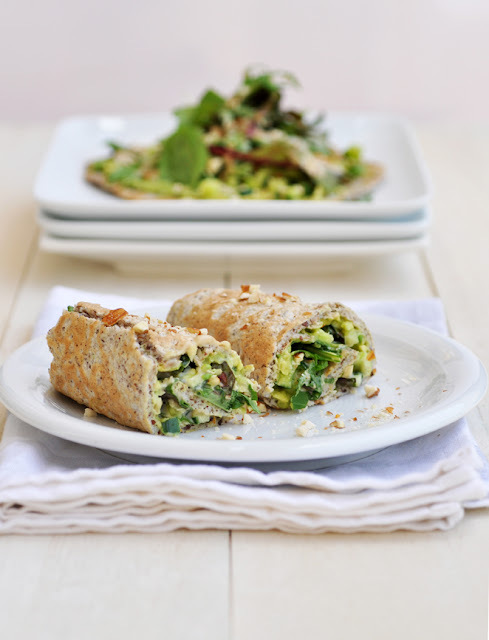 One of my favorite lunch over the past two weeks have been wraps with a all-raw filling of avocado, cucumber, mixed greens, nuts and seeds and tahini sauce. The filling has all the freshness and crunch and layers of flavor that you will want on a hot summer day. If you don't have time to cook the wraps, any store-bought tortilla wraps will be fine too. Enjoy. In a bowl, combine coconut flour, flax meal, tapioca starch, salt and baking powder. Mix well. Add egg whites and water and stir vigorously until well combined and without any lumps. The consistency should be runny. Stir in flax seeds, sunflower seeds and sesame seeds. Heat a medium-sized frying pan over medium-low heat, and brush it with some oil. Pour or ladle about 1/4 cup of the batter into the pan. Swirl it around to spread the batter into a thin round layer. Cook until firm and lightly browned on the bottom side. Then flip and cook the other side until lightly browned. Transfer wrap to a plate. Brush pan with some more oil before cooking each wrap. Repeat until remaining batter is used up. Place the tahini sauce into a small bowl. Season with some salt. Then pour boiling water over it and stir vigorously until well combined and smooth. It should get the consistency of a typical dressing sauce, not too runny. Place a wrap in front of you. Spread a generous layer of mashed avocado over three quarters of the wrap, leaving the part furthest from you clean. Sprinkle the finely chopped cucumbers and some mixed leaves over the avocado layer. Drizzle about one tablespoon of the tahini sauce over it and sprinkle with chopped nuts. Tightly roll up the wrap starting on the side closest to you. Then cut in halves. Repeat with remaining wraps and fillings. Serve immediately.